Elizabeth Chaplin won’t be quite so lonely at DuPage County Board meetings anymore. The Downers Grove resident, until last week the Democratic Party’s lone board member, will be joined by a half-dozen party members after a Blue Wave election that also gave Democrats their first countywide office in living memory. Jean Kaczmarek defeated Republican incumbent Paul Hinds to win the County Clerk’s office. Democrats also came close in races for County Board chairman and treasurer. The stunning showing came in a longtime Republican stronghold that has grown increasingly diverse and competitive in recent years. The state Democratic ticket also recorded a DuPage sweep while voters went with Democrats in six congressional races in districts that overlap the county, including victories by county residents Sean Casten (6th) and Lauren Underwood (14th). Democrats also scored victories in nearby counties including Ron Hain’s upset win for Kane County sheriff. Two Democrats — Amy Cesich and Robyn Vickers — won election to the Kendall County Board. Democrats won one countywide office, came close in two others and elected seven members to the County Board. Democratic winners — all women — included Kaczmarek who will serve a short term as the clerk’s office merges with the DuPage Election Commission. Republican County Board Chairman Dan Cronin survived a stiff challenge from Democrat Lynn LaPlante, earning 51.6 percent of the vote. Republican James Mendrick, a patrol commander with the DuPage County Sheriff’s Department, beat Democrat Gregory Whalen for the top job. Republicans will still run the County Board, but last week’s Democratic surge resulted in six new board members from the Democratic Party. Chaplin was reelected in District 2, while first-time winners, all women, included Ashley Selmon (District 1), Julie Renehan (District 3), Mary FitzGerald Ozog, (District 4) and Dawn DeSart and Sadia Covert District 5). Hadiya Afzal, the 18-year-old Democrat featured in a Teen Vogue magazine profile of young candidates, finished fourth in District 4. 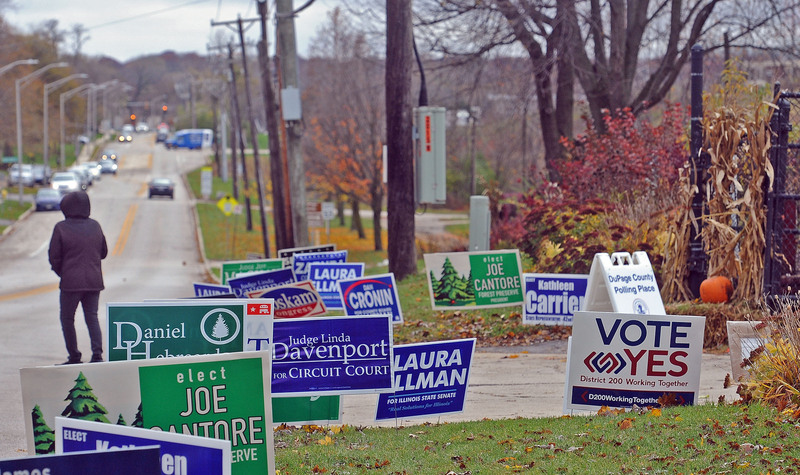 The Democratic blue wave diminished at the Kane-DuPage county line as both parties had election successes to crow about. Democrat Ron Hain had the local upset of the night, winning the sheriff’s office by more than 9,000 votes over incumbent Republican Donald Kramer. But county clerk Jack Cunningham prevailed in what was a tight race much of the night before pulling away to a 6,000-vote triumph. Incumbent Republican David Rickert won another term as treasurer, scoring a nearly 10,000 vote margin over Democrat Jason Snelson. Odd-numbered County Board districts (plus District 6) were up for election. Republican winners included incumbents Bill Lenert (District 5), John Martin (District 11) and Barbara Wojnicki (District 15). Democrat Mohammad “Mo” Iqbal beat GOP incumbent Kurt Kojzarek (District 19). In District 6, Democrat Matt Hanson beat Ronald Ford, who ran as a write-in candidate, for a two-year term. In races without incumbents, winners included Democrat Anita Marie Lewis (District 3), Republican Steve Weber (District 13), Republican Cliff Surges (District 21) and Democrat Christopher Kious (District 23). 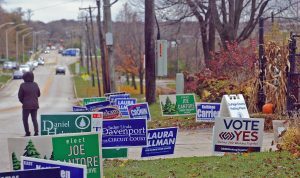 Batavia voters overwhelmingly rejected a referendum question that would have ended home rule in the community. Communities above 25,000 in population are permitted to pass laws to govern themselves as they see fit within the confines of the state and federal constitutions. It was the first election with the entire county process supervised by the Kane County clerk’s office. Previously, the City of Aurora Election Commission handled elections in that city before it was abolished by voters in the March 2018 primary. An overwhelming number rejected a proposed 1 percent sales tax that would have funneled more than $5.5 million into Oswego Community Unit School District 308 for facility improvements. While the money would be barred from being used to pay for teacher or administration salaries or pensions, it could go toward maintenance, roof and parking lot repairs, security, safety, American’s with Disabilities Act compliance, additions and new facilities. The sales tax proposal was soundly rejected, losing by 10,880 votes. Proceeds from the tax would have been distributed to Kendall County school districts based on enrollment figures. While the state Democratic ticket prevailed here, local Republicans held their own in most county races. County Clerk Debbie Gillette easily beat Democrat Andrew Torres in the only contested contest. County Treasurer Jill Ferko and Sheriff Dwight Baird faced no opposition. Democrats captured two County Board seats but are still a distinct minority. Republicans swept three countywide offices. Douglas Johnson collected 51.2 percent of the vote to top Democrat Carolyn Beth Morris for County Clerk. Christine Johnson had 55.5 percent to easily win for County Treasurer over Democrat Liliana Orozco. Incumbent Sheriff Roger Scott was unopposed for reelection and picked up 27,514 votes. In six contested County Board races the incumbents — four Republicans and two Democrats — all won election.